Well, this took place last night. Maybe I should have posted before the show but my involvement happened so fast! Wednesday night, while having a lovely birthday dinner with my lady, I decided I wanted to keep making gig posters for comedy shows after the success I had with the Better Off Dead Live Read. 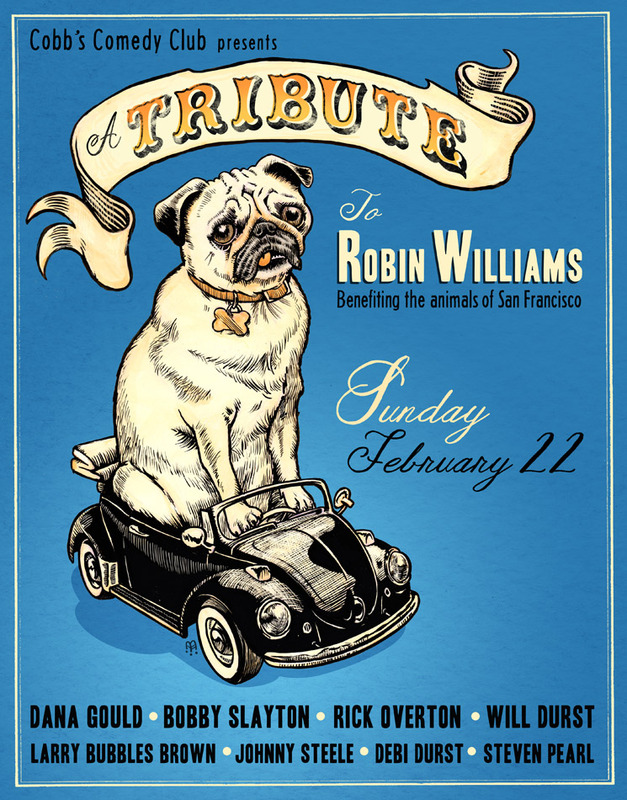 I went home, checked some schedules, and found that in three days time, Cobb's Comedy Club would be putting on a special show in tribute to Robin Williams, benefiting his favorite animal rescue groups. I had to get involved! I already had the illustration of Leonard I had done for Robin last year so I reconfigured it into this poster and managed to get in touch with the right people. We were able to get everything cleared and print up 100 posters to sell at the show. It was such a fun night. The comics killed it. I wish Dana Gould could have made it. Oh well, for now I'll re-listen to his podcasts. With the proceeds from these posters, funds were pushed past the organizers' goal! Yeah! That's for you, Robin, Leonard, Remi (my buddy adopted from Rocket Dog Rescue) and all the dogs and cats who still need our help. Check out all the organizations that took part, Friends of SFACC, Wonder Dog Rescue, Curly Tail Pug Rescue, Give Me Shelter Cat Rescue and Muttville Senior Dog Rescue. A few weeks ago I got a chance to see Family Crest perform and was blown away by these guys. They are a classically trained, orchestral indie rock band inspired by jazz, folk and classical music. Regardless of all the Wikipedia stuff, they are just a kick to see perform. Aside from sounding impeccable live, they are all super-nice and enthusiastic. That's the kind of people I want to make cool posters for. This poster is for an upcoming show at Bottom of the Hill (no duh). I'm going to rework it for another Family Crest performance coming up at The Starry Plough in Berkeley. That's all for now! Go check these cats out.